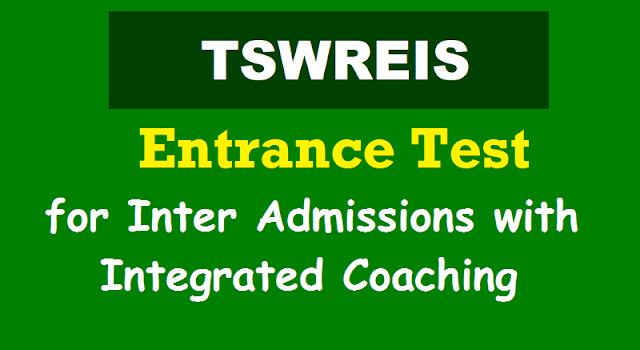 TSWREIS Entrance test for Inter admissions with Integrated coaching 2019-2020. TSWREIS Entrance test for Admission into 1st Year Intermediate With integrated coaching for IIT-JEE/EAMCET/NEET/CA-CPT/CLAT- 2019-2020: Free inter with integrated coaching, Entrance Exams free coaching in TSWREIS Colleges. TSWREIS Entrance Test 2019 for IIT, COE, Magnet colleges Inter admissions, Inter 1st year admissions, IIT-JEE/ EAMCET/ NEET/ CA-CPT Integrated Coaching Admissions, Selection list/Merit List/Qualified Candidates List/Eligibility List for 2nd Level Screening Test for 2nd Level Screening Test: TSWREIS Entrance Test 2019-2020 for Admission into 1st Year Inter with Integrated Coaching/ TSWREIS Entrance Test for Join Inter with IIT-JEE/ EAMCET/ NEET/ CA-CPT Coaching 2019. Telangana Social Welfare Residential Educational Institutions Society (TSWREIS) has issued an entrance test 2019 notification for Admission into 1st Year Inter With Integrated Coaching For IIT-JEE/ EAMCET/ NEET/ CA-CPT in the institutions of Society. The TSWREI Society invites applications through online mode from eligible and qualified Boys and Girls for admissions into 1st year intermediate MPC (with IITJEE/EAMCET coaching) and BPC (with NEET Coaching) and MEC/CEC (with CA-CPT Coaching) with English as the medium of instruction for the academic year 2019-2020. The following Institutions are functioning with the above courses under the TSWREI Society. 2. Before filling the application through online the candidates have to read the information/ prospectus already uploaded in the website www.tswreis.telangana.gov.in. 4. The Candidates can opt the colleges while applying on-line. The candidates shall be considered for admission into the colleges according to their option. The option once exercised is final and cannot be changed. 05.01.2019 through online. The same has to be certified by the Principal / Head Master, where the candidate is studying. 2. The Candidates who secured B2 and above grade in SSC Public Examinations, 2019 are eligible for admission. 1. The 2nd Language in all these Institutions shall be Telugu. 2. The medium of instruction in the above colleges is ENGLISH only. ** Last date for submission of applications through ONLINE is: 23.01.2019. ** Hall tickets can be downloaded from 12.01.2019 to 17.01.2019. TSWREIS will announce the list of candidates: The Telangana Social Welfare Residential Educational Institutions Society (TSWREIS) said that the list of students who got selected for second round of screening for admission into IIT/COE has been made available on the website www.tswreis.gov.in. The residential educational institutions society advised candidates to visit the website for details. Merit List/Qualified Candidates List/Eligibility List for 2nd Level Screening Test for 2nd Level Screening Test which will be held on ..